::: Off the Radar :::: Freeze! Pop! 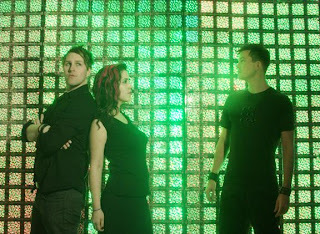 Freezepop is a minimal electro-pop trio hailing from Massachusetts. I first met them a few years ago when I brought them down to do a show @ I/O and I've stayed in contact with the band, particularly lead singer Liz/Jussi ever since. She was the first person to introduce me to the Swedish electro-pop duo Tribeca, for which I am eternally grateful. Fans of bands like Postal Service should definitely check them out as well. Their every bit as good as the masters Postal Service which I hear are also working on new material! Finally! The first song I ever heard from Freezepop was 'Plastic Stars' which I loved instantly and started playing out every chance I got way back in those amazing Piccadilly PopLife Days. It's good to see they still have it on their MySpace player. Most bands get sick of their older hits and do away with them. Anyways after a couple years wait from their last full length I had been itching for some new material from Freezepop. Then I go check my mail the other day and to my delight there's a Shiny New Freezepop CD filled with great Lite Bright type artwork and photography. It's their 3rd Full Length album 'FutureFutureFuturePerfect' which was just released September the 25th. The new album is pretty much of the same vain as their first two albums. Simple, catchy, dancey, electro-pop fun! Their first single from the album is called 'Less Talk More Rokk' and was featured in the videogame Guitar Hero II. They also have a few slower tracks on the album such as 'Thought Balloon' and 'Swimming Pool' which I always tend to like from them because it showcases Liz's voice. When the tracks are slowed down you can really appreciate her great singing voice. Another thing I love about Freezepop is their sense of humor. With track titles like 'Do You Like My Wang? ', 'Pop Music is Not a Crime' & 'Ninja of Love' it can only bring a smile to your face. The last thing they put in their credits too is 'no real instruments were used in the making of this recording' Classic! Anyways without further a-do here is some new music by them and that classic 'Plastic Stars' track I was talking about. I also saw a cool new video for 'Less Talk More Rokk' starring mice! Which I'll be posting. Go find them on Myspace and add them. They have 54,000+ friends now!